The Coach in these two videos is Lason Perkins. Coach Perkins has worked at the high school, college, and semi-pro level for over 20 years. He is currently the Head Boys Basketball Coach at Cary Academy. He has created over 20 instructional videos and 5 books on basketball offenses. There is sound with these videos. Click the play arrow to view them. Today’s post shows 2 middle ball screen sets where the screen is set for a player catching a pass forcing their defender to close out and immediately get hit with a ball screen. 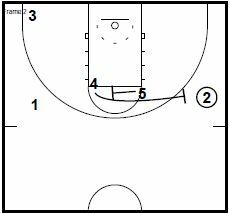 These plays are included in the Basketball HoopScoop’s Comprehensive Ball Screen Playbook (written by Trey Watts). It is a part of this week’s featured eBook bundle. Click for information on how to purchase The Comprehensive Ball Screen and Hybrid Princeton Offense eBook bundle. 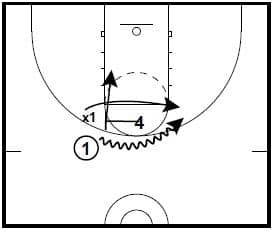 On both plays, you might need to take only a part of the play, change the positions of the players, change the angles of the cuts or screens to fit what you need. 1 passes to 4 at the top of the key. 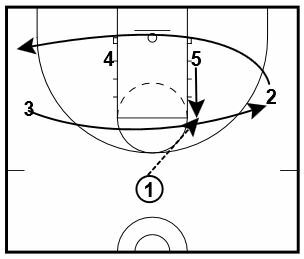 4 reverses the ball to 2. 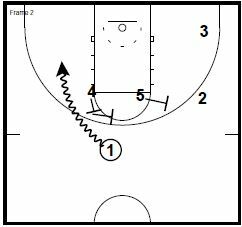 5 steps out and screens for 1 who cuts toward the opposite block. 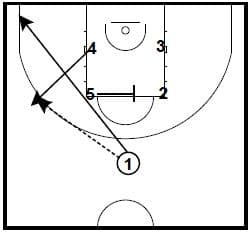 1 changes direction and back screens for 4. 5 moves to the middle of the floor. 5 screens for 1 on the catch then rolls. 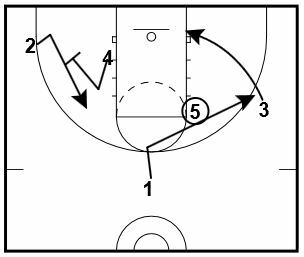 4 cuts to the wing and receives a pass from 1. After passing to 4, 1 cuts through to the ball side corner. 2 curls the cross screen. 3 Flashes to the top. 2 spaces to the arc in the right corner. 5 steps up and ball screens for 3 on the catch. The plays are included in the Basketball HoopScoop’s Comprehensive Ball Screen Playbook (written by Trey Watts). 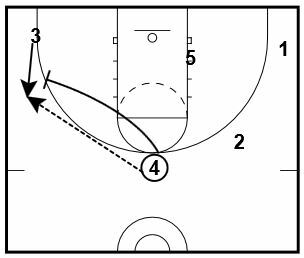 Today’s post is a couple of ideas for attacking teams that go under ball screens. It is a part of this week’s featured eBook bundle along with Jimmie Oakman’s Pack Line Defense Playbook. The purpose of the post is not to say that anyone should run this exact play unless it fits your personnel, what you run on offense, and how your opponents defend you. The purpose is to stimulate your thinking as to how to make adaptations to this that might help you. Teams often go under the screen if the ball handler is a non-shooter or good penetrator. 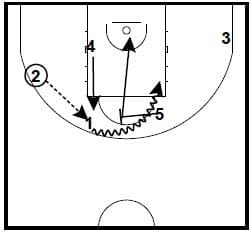 One way to combat teams going under is a double ball screen into a “TWIST” CALL. It forces a team that goes under ball screens to go under even further. 2 and 3 are spaced in the corners. 4 and 5 set a double wide ball screen for 1. 5 rolls to the basket and 4 pops to the top of the key. 4 then comes back and sets a Twist or rescreen on x1. If you don’t like the spacing that the double screen creates, then you can run it as a single screen into a Twist. 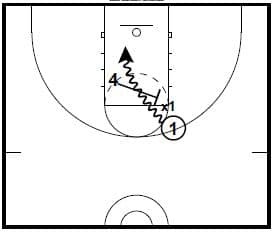 Today’s post is an idea for attacking teams that go under ball screens. 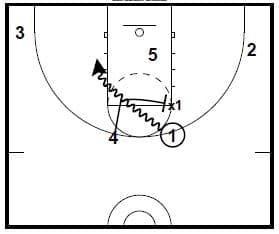 This play is included in the Basketball HoopScoop’s Comprehensive Ball Screen Playbook (written by Trey Watts). 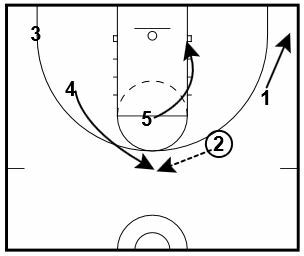 These sets are from Brad Steven’s Boston Celtics Playbook from the Basketball HoopScoop. It is bundled with his Butler Playbook for $25. 2 AI cuts over the top of 4 and 5. 3 clears to the L corner. 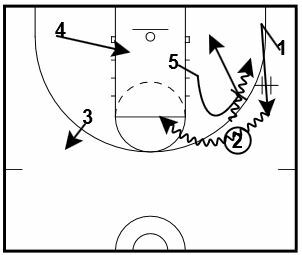 4 sprints into a wing ball screen for 2. 5 pops to the top of the key after screening for 4. 2 throws ahead to 5 at TOK as 4 rolls. If 5 doesn’t throw it, he looks to the left side of the court for weak side action (dribbling at 1 for backdoor, pass to and ball screening for 3; or 1 down screening for 3 to get a DHO from 5). 2 AI cuts over the top of 4 and 5. 3 clears to the R corner. 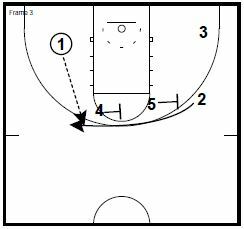 1 drives off 4’s ball screen. 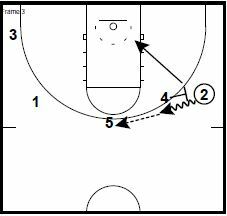 1 has option to take it to rim or throw back to 2 coming off the double behind. It is bundled with his Butler Playbook for $25. You can find out more information about these Coaching eBooks here: Brad Stevens Playbook Bundle. 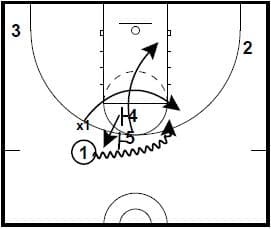 University of Maine Men’s Assistant Coach Zak Boisvert has assembled some of his favorite ways to beat Ice ball screen coverage. You aren’t going to be able to use all of these, but I hope that you can find one or two that fit your player’s abilities. 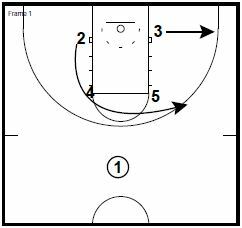 2 will go under the two posts on the baseline. 3 will go over the top. When 3 goes over, 5 will flash to the elbow. 1 hits 5 at the elbow. 3 will plant and go backdoor. 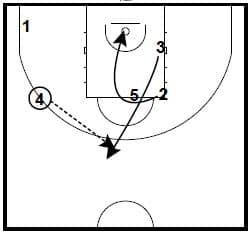 5 looks at 3 on the backdoor cut. 1 cuts away to allow time for 3 to clear. 1 will come around for a HANDOFF from 5. 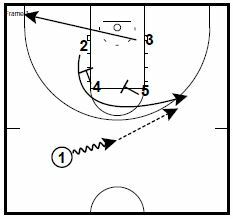 4 will set a corner screen for 2 coming up. 5 fakes the handoff and takes a bounce towards the NAIL. 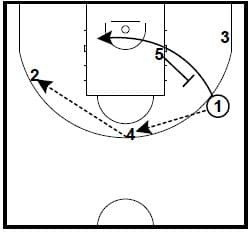 2 continues off the screen and get a DRIBBLE HANDOFF from 5. 4 will follow 2 after setting the screen. 3 has finished his backdoor cut to the corner. We are now into our high low set. 2 will look for 5 on the roll. 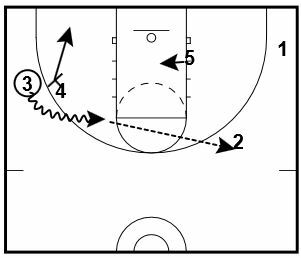 2 reverses the ball to 4. 4 flares to the short corner after ball screening. 5 tries to pin inside by the rim. 3 kicks the ball out to 2. 2 looks inside to 5 on the pin. 5 was not open on the pin. 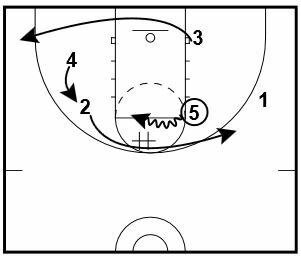 2 runs a DRIBBLE HAND OFF with 1 in the corner. 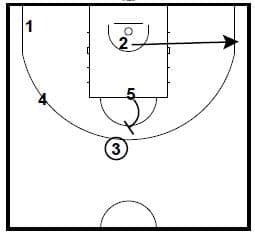 5 elevates behind the DRIBBLE HANDOFF and set a BALL SCREEN FOR 1. 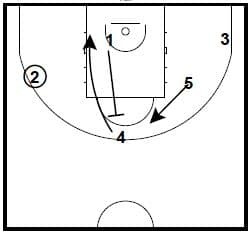 1 attacks off the ball screen. 5 rolls to the short corner and 4 pins inside.